Prepare for the stares. 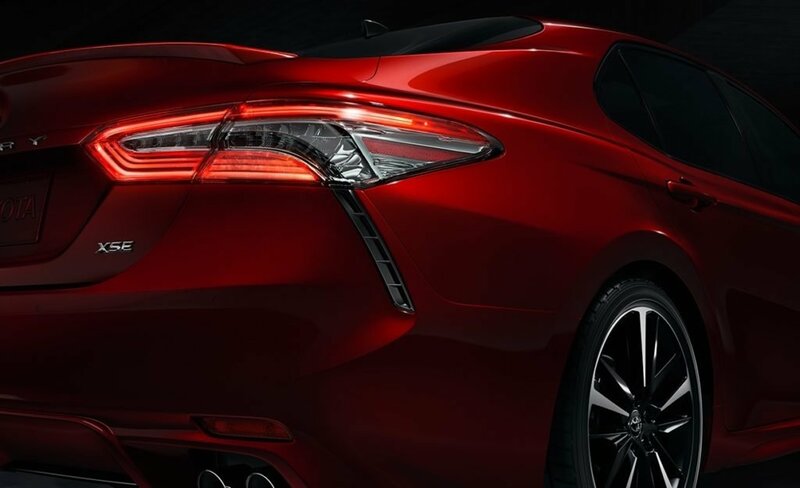 It’s tough to ignore the all-new 2019 Toyota Camry—it demands to be seen, and driven, with its fearless new look and seductive performance. Years of perfecting our beloved best-seller has allowed us to create this exhilarating drive that puts you in the driver’s seat like never before. Let powerful design and aggressive exterior styling announce your arrival—with authority. 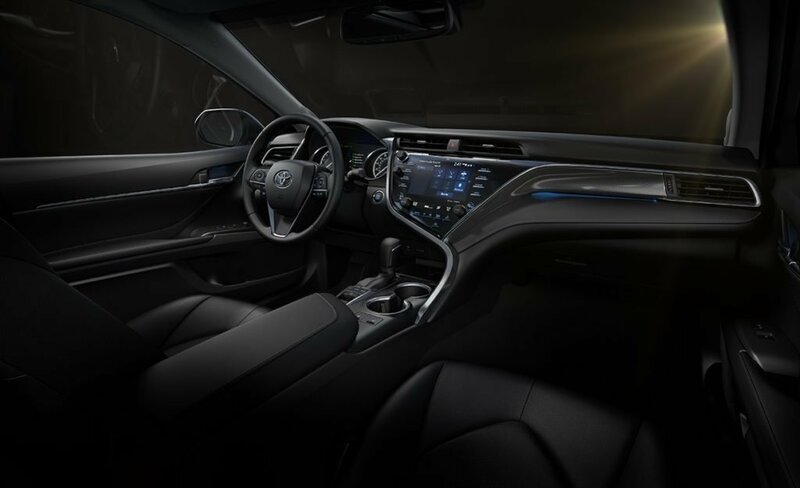 The intuitive driver-centered controls and inspired handling help you embrace each journey, while the available dual exhaust with quad chrome tips punctuates every sporty shift. 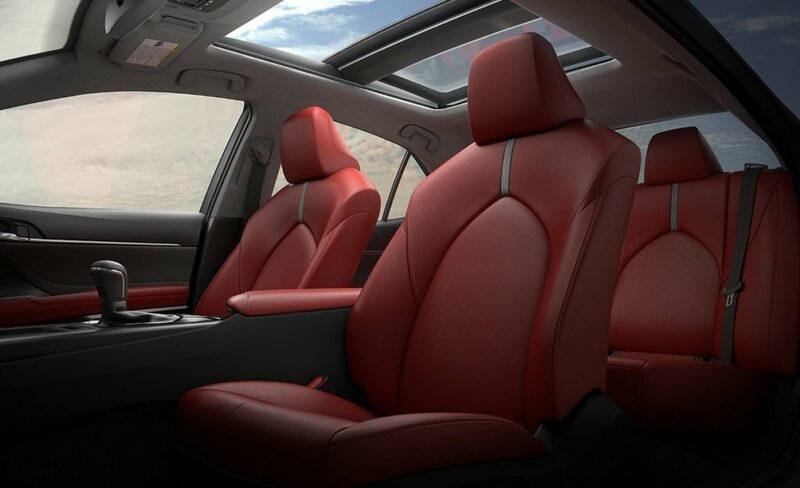 And inside, enjoy a wider and more open space, thanks to an available panoramic glass roof with moonroof. Camry even comes with peace of mind, as Toyota Safety Sense™ P (TSS-P)1 is standard. Let’s go more places in complete confidence—and always arrive fashionably great. Leave a lasting impression- Camry XSE’s powerful stance and captivating style will announce your arrive with authority. The muscular shape is defined by a pleasing mix of sweeping curves and chiseled surfaces. Sport side rocker panels and the integrated rear spoiler emphasize the coiled stance and redirect airflow to enhance efficiency and performance. 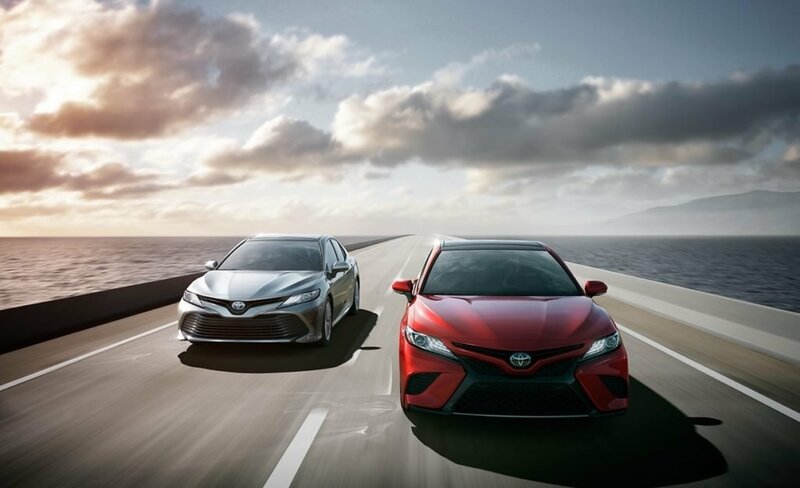 A distinctive front grille, all-new wheel designs, new LED headlights and taillights have been added to the all New Camry 2018. It’s an irresistible symphony of flowing lines and sharp, unconstrained edges that always make an impact. Joyride for your senses with V6 and 2.5L engines. New direct shift 8-speed electronically controlled automatic transmission with eco, normal and sport modes. 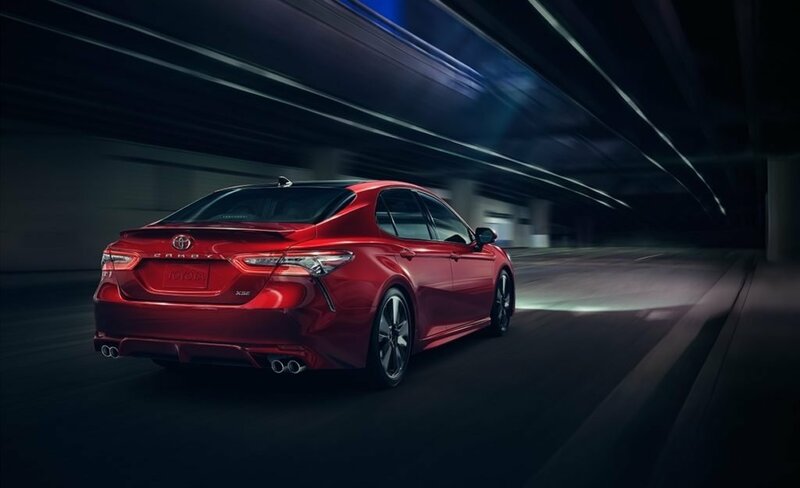 The Camry’s new double-wishbone rear suspension, delivers a smooth ride and sharp handling. Camry Hybrid’s Sport Mode improves throttle response, while ECO Mode adjusts throttle input to maximize your efficiency. EV Mode enables electric driving to reduce noise and emissions. 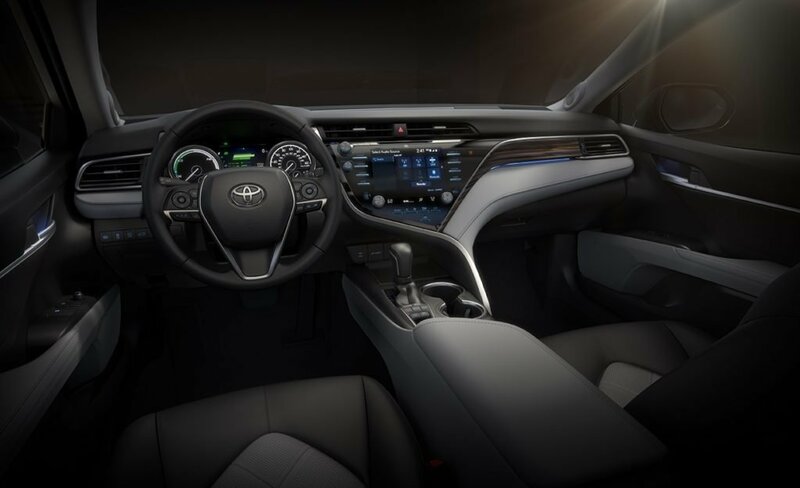 Toyota Safety Sense™ P (TSS-P),1 includes PreCollision System2 with Pedestrian Detection (PCS w/PD),3 Lane Departure Alert with Steering Assist (LDA w/SA),4 Automatic High Beams (AHB) 5 and Full-Speed Range Dynamic Radar Cruise Control (DRCC),6 peace of mind comes standard with every single Camry. Other available innovative safety features include Blind Spot Monitor with Rear Cross Traffic Alert (BSM w/RCTA), Intelligent Clearance Sonar with Rear Cross Traffic Braking (ICS w/RCTB), Bird’s Eye View Camera with Perimeter Scan, Toyota Star Safety System™ & Safety Connect®. It’s time to reward your wants. And your desires. *Prototype shown with options. Production model may vary. 1. Drivers are responsible for their own safe driving. Always pay attention to your surroundings and drive safely. Depending on the conditions of roads, weather and the vehicle, the system(s) may not work as intended. See Owner’s Manual for additional limitations and details. 2. The TSS Pre-Collision System is designed to help avoid or reduce the crash speed and damage in certain frontal collisions only. It is not a substitute for safe and attentive driving. System effectiveness is dependent on road, weather and vehicle conditions. See Owner’s Manual for additional limitations and details. 3. The Pedestrian Detection system is designed to detect a pedestrian ahead of the vehicle, determine if impact is imminent and help reduce impact speed. It is not a substitute for safe and attentive driving. System effectiveness depends on many factors, such as speed, size and position of pedestrians, and weather, light and road conditions. See Owner’s Manual for additional limitations and details. 4. Lane Departure Alert with Steering Assist is designed to read lane markers under certain conditions. It provides a visual and audible alert, and slight steering force when lane departure is detected. It is not a collision-avoidance system or a substitute for safe and attentive driving. Effectiveness is dependent on road, weather and vehicle conditions. See Owner’s Manual for additional limitations and details. 5. Automatic High Beams operate at speeds above 25 mph. Factors such as a dirty windshield, weather, lighting and terrain limit effectiveness, requiring the driver to manually operate the high beams. See Owner’s Manual for additional limitations and details. 6. Full-Speed Range Dynamic Radar Cruise Control is designed to assist the driver and is not a substitute for safe and attentive driving practices. System effectiveness is dependent on road, weather and traffic conditions. See Owner’s Manual for additional limitations and details.